How should investors “read” the pronouncements of Donald Trump? That question has prompted endless debate around the world in the past two years. But here is a new answer: try an Agatha Christie novel. Yes, you read that right. Any fan of her mystery books knows that distraction is a powerful plot device: if there was a commotion in the kitchen, detective Hercule Poirot would look for a body in the library, or other clues being hidden in plain sight, amid the noise.While Mr Trump has never admitted to be a Christie fan, his tactics — or instincts — might usefully be viewed in this light. Whenever the US president’s startling pronouncements create an attention-grabbing storm, investors must ask what bodies are being disposed of, amid the melodrama. Take this week’s events concerning the US Federal Reserve. On Sunday, Fed-watchers were startled when the Washington Post published an interview with Mr Trump, in which he breached all convention by saying he was “not one little bit happy” with his choice of Jay Powell to chair the central bank. Apparently this was because Mr Powell has raised rates, and signalled he will continue doing so. The Fed “is way off base with what they are doing”, Mr Trump declared. As plot-lines go, this makes for dramatic viewing, not least because it gives Mr Trump the type of starring role he adores. But like any mystery novel, there is more than meets the eye. Mr Powell’s speech, which was largely written before the president’s broadside, essentially echoed the same point. He notably did not rule out more rate rises. As such, it represents a thoroughly sensible stance. To put it another way, this is merely half a “blink” in the face of global uncertainties. But more important issues were not widely discussed amid the noise. One overlooked item was a warning from Mr Powell that risky corporate debt has surged and “highly leveraged borrowers would surely face distress if the economy turned down.” Another was the raging debate about how fast the Fed should reduce its balance sheet. This is receiving little or no public attention, even though the shrinkage is having as much, if not more, impact on financial conditions than policy rates. Investors should also consider the relative silence around the fact that the US deficit is nearing the $1tn mark for the first time in history and recent signs that the US recovery is softening. Consumer confidence and house sales have declined and US farmers are suffering as soyabeans rot in silos, amid the trade war with China. The automotive sector also fits the Christie narrative. Mr Trump grabbed attention with strident tweets attacking General Motors over planned US plant closures, and contrasting it with BMW’s announcement of a new US plant. But what has barely been discussed is the deep irony of the current trade threats over cars. The main automotive exporters from the US to China are not Detroit’s big three carmakers but German-owned groups including BMW. They have every incentive to move production to China if retaliatory tariffs are imposed. A cynic might argue it was ever thus: any effective politician knows how to bury bad news and shape the agenda. And Mr Trump has every reason to attack Mr Powell or GM. He will need somebody to blame if (or when) the economy slows down. But here is the key point: in a world of information overload, Mr Trump uses the weapons of distraction more effectively than almost any leader before him. So by all means gawp at this week’s Fed drama. But remember: Poirot would not be fooled. Developing countries such as India, Kenya and others in East Africa are discovering an increasing array of applications for blockchain, the decentralized ledger technology that promises a secure, peer-to-peer mechanism for verifying information. Blockchain is finding innovative uses in banking and financial services, supply chains, agriculture and in managing land ownership records (land titling) in those countries, according to panelists who spoke at the Wharton India Economic Forum held recently in Philadelphia. However, many laws in both developing and developed countries have not kept pace with digital advancements, and they continue to require paper-based documentation, preventing participants from taking full advantage of the technology, they said. Although a decade has passed since the blockchain’s invention, its technology is still evolving and being tested. Blockchain is essentially a growing list of so-called “blocks” (a record of transactions in a decentralized ledger), which form a “chain” in a peer-to-peer network. Participants in the network verify or validate the blocks, eliminating the need for a trusted entity like a regulator or an accounting firm to authenticate the information in them. According to experts, the blockchain is secure and tamper-proof by design because transactions cannot be changed once the network has verified them. The technology promises to speed up and reduce the cost of transactions, and boost financial inclusion by providing more opportunities to farmers. Notably, the Wharton India Economic Forum met around the 10th anniversary of the introduction of the blockchain. It was on October 31, 2008 that a certain Satoshi Nakamoto published a white paper introducing the cryptocurrency bitcoin — and blockchain, its underlying technology. It has been speculated that Satoshi Nakamoto is a fictional name used by an unknown person or a group of people. Another misconception is that blockchain is “a scam,” and that “it’s dead, it’s over,” said Werbach, an expert in emerging technologies, the internet and communications law. “A surprisingly large audience still doesn’t understand what’s going on [with blockchain],” he recently wrote in an opinion piece in Knowledge@Wharton. He also authored the book The Blockchain and the New Architecture of Trust. “Blockchain is not magic, but it has interesting capabilities,” Miller continued. Although there is “a lot of hype and excitement about blockchain,” she said, the technology is still in the early stages of implementation, and testing of its potential applications is underway. India is a frontrunner among emerging economies in embracing the blockchain, according to Kavita Gupta, founding managing partner of ConsenSys Ventures, the venture capital arm of ConsenSys, a blockchain software firm. Gupta said her firm is working on implementing blockchain in a land titling project with NITI Aayog, the Indian government’s policy think tank (NITI stands for National Institution for Transforming India), and has signed a Memorandum of Understanding with the Andhra Pradesh state government for an array of uses, including in land titling, supply chains, health records and blockchain education. In supply chains, Mumbai and Visakhapatnam ports are using the blockchain to create tamper-proof methods that track incoming shipments and shippers, Gupta said. Those systems are also able to ensure that shipping-related payments reach the right parties. The identities of those parties are verified through the government’s Know-Your-Customer program that was launched a few years ago to combat fictitious accounts and money laundering. Gupta said the Mumbai Port Trust has projected savings of $18.2 billion over two years from using blockchain technology in supply chains. Blockchain is also demonstrating visible social impact in several cases. For example, India’s northeastern states of Assam and Sikkim are using it to help their tribal people secure ownership titles to lands that the government had promised them at the time of India’s Independence in 1947, said Gupta. “The tribals want to prevent mineral mining and other industries from taking over those lands,” she added. IBM-led artificial intelligence and blockchain projects in India are helping improve crop yield for agriculture companies and helping others transition to the unified goods and services tax (GST) system that was launched last year. IBM’s Research Lab has completed three pilots with Indian companies with use cases like pest and disease prediction, improving yield, and yield prediction on India-specific crops like potato and sugarcane, Miller said, pointing to a news report in Quartz India. The company is also working closely with India’s central bank, the Reserve Bank of India, for banking applications, and with the Mahindra Group in a supply chain project. IBM’s India Lab is its biggest research arm outside North America focusing on those technologies. In Nairobi, Kenya, IBM has worked with Twiga Foods, a business-to-business logistics platform for kiosks and food stalls across Africa to extend micro-finance loans to vendors, which in turn would help them buy more inventory. IBM built a blockchain-enabled lending platform to overcome the obstacle of ascertaining the creditworthiness of the food vendors, said Miller. IBM analyzed purchase records from mobile devices and then applied machine-learning algorithms to predict creditworthiness. Once the credit scores were determined, it used a blockchain to manage the entire lending process from application to receiving offers, to accepting the terms, to repayment, according to an IBM post. Miller said those applications have potential in India as well. Indeed, lending is a good use case for blockchain applications. “It is about the identity of the person who wants a loan, and if you can verify the person’s financial or personal history, or if they have a viable business that needs to be financed, you can cut out a lot of the process,” Miller said. “It is especially helpful for small businesses that don’t have a strong record of owning and operating a business, or the conventionally required credit scores.” The vendors in the micro-finance project in Nairobi, for example, are able to build their credit as they repay their loans and become eligible for larger loans, she noted. Gupta also cited a project in Nigeria involving the cleanup of a river belt along the River Niger where blockchain and IoT technologies are being used to monitor toxin levels. The findings are considered quantifiable results in reporting to the NGOs and other international organizations that are financing that project, she added. In another example, Miller cited an insurance company that processes workers’ compensation claims. It uses wearable devices to verify that the workers were actually at the construction site instead of somewhere else. Linking that data to the blockchain lets the insurer verify the information related to a claim and decide whether or not to process it. Even as blockchain technology has made inroads into developing countries like India, inadequate digital infrastructure and relatively low financial literacy may be obstacles. However, even more than those, outdated laws and rules are proving to be the biggest impediments to achieving blockchain’s full potential. According to Gupta, such shortcomings exist also in developed countries like the U.S., and cited a case in Ohio where there were similar disconnects between a county government and the state government. In some places like Dubai or Singapore, governments actively “work with you to change the rules as needed,” she added. Miller noted that often, many pieces of a process — such as with a supply chain, for example — are not fully digitized. Blockchain lets users pinpoint where they need to work on “non-blockchain digitization” of specific aspects of the process, she said. For example, IBM is helping Walmart use blockchain with its suppliers in order to meet food safety requirements. IBM built a simple app where farmers could scan and send information on the produce they ship to Wal-Mart. “The app we built is not complicated and it was not a blockchain app, but it was a single piece of digitization that made the blockchain app work,” she said. Often, the pace at which users adopt blockchain depends on the quality of the UI (user interface) and UX (user experience), said Gupta. She shared the experience of an online payment system in East Africa in which her fund had invested. “They had to literally go to the tribals and figured that a text-based system was the only thing they could understand,” she said. “If you give them a simple form which has a ‘yes’ and a ‘no’ they can read in Swahili, they could operate it.” She noted that over the past decade, such text-based systems have been popular worldwide. India could comfortably use such text-based systems because “everyone has a cell phone, even in the villages,” she added. According to Miller, the role of the government is “keep people safe,” and that that maxim applies to India as well. “You want to clear the path for innovation, but prevent people from being taken advantage of in an unethical way, and preventing bad actors from causing harm. That is the philosophical role of government in blockchain.” In the U.S., the Securities and Exchange Commission has issued a series of investor alerts on initial coin offerings, or ICOs, that issue tokens or cryptocurrencies. Werbach noted that in the case of India, its legal system “is incredibly convoluted, and there are much bigger problems in that area just [relating to] blockchain.” His advice: “Don’t start with what you need to tweak for blockchain. Start with what you need to allow entrepreneurs to innovate.” At the same time, he said, most of the legal changes that are required for blockchain are still underway in the U.S. as well. Many of the changes needed are those that make way for technology, where existing rules might require paper documentation, he explained. Businesses considering using blockchain need to recognize that the technology is still in its early stages. Gupta advised users to maintain open technology platforms to enable faster adaption of newer applications. Miller added that agility is important to ensure that the business keeps pace with regulations. That approach also ensures that the company is less likely to be targeted by regulators for fines and fees, she said. 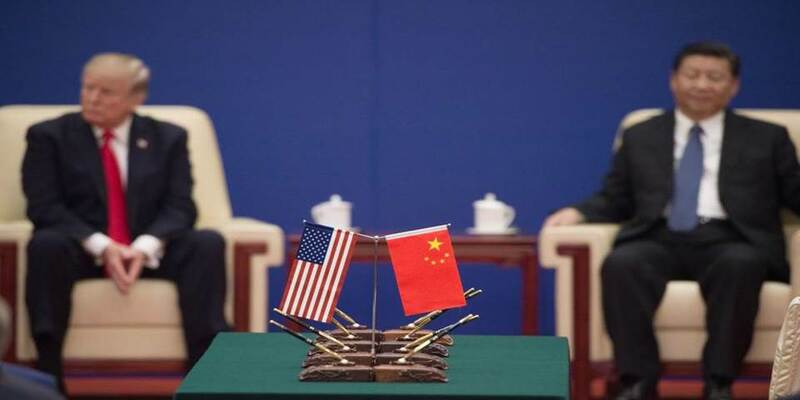 After years of economic symbiosis in which the US purchased low-cost Chinese imports and China purchased US Treasuries, China has begun to pursue the prerogatives of a superpower, and the US has responded in kind. As a result, both countries are becoming more alike, particularly in their belief that there can be only one winner. BERLIN – There has long been talk that the strategic rivalry emerging between the United States and China in recent years could one day give way to confrontation. That moment has arrived. Welcome to the Cold War 2.0. The standard narrative about the Sino-American conflict is that it pits two distinct systems against each other. To the US, China is a big-data dictatorship that has detained one million Uighurs in concentration camps, cracked down on Christians, curtailed civil rights, and destroyed the environment – all while building up its military and threatening America’s regional allies. In the view of many Chinese, the US is an exponent of interventionism and imperialism, and the Trump administration’s trade war is merely the opening shot in a larger economic, military, and ideological contest for supremacy. At the same time that China has been reorienting its economic-development model, the US has replaced its traditional laissez-faire approach with an industrial strategy of its own. Behind Trump’s trade war is a desire to rebalance the economic playing field and “decouple” the US from China. And with both countries now locked in a zero-sum competition, Team GAFAM (Google, Apple, Facebook, Amazon, Microsoft) and Team BATX (Baidu, Alibaba, Tencent, Xiaomi) are waging a war of technical know-how and data access on a global scale. Yet by trying to outcompete each other in the same areas, the US and Chinese strategies are becoming more alike. In response to former US President Barack Obama’s efforts to create a Pacific-rim trade bloc to contain China, Xi launched his Belt and Road Initiative (BRI), which is now being met by an American-led Indo-Pacific initiative under Trump. The two countries are also on similar paths militarily. Though China still has a lot of catching up to do, its total defense spending is already second only to the US. It has built and launched its first aircraft carrier, and has plans to launch more. It is developing and deploying anti-access/area-denial (A2/AD) defense systems. And by establishing its first overseas military base in Djibouti, it has signaled that it has global – not merely regional – ambitions. China and the US also increasingly share a predilection for interventionism. For China, this represents a stark break from decades of treating non-intervention as a quasi-religious doctrine. But China’s changing attitude makes sense. As Yan Xuetong of Tsinghua University explained to me shortly after the US invasion of Iraq, a country’s support for intervention reflects a recognition of its own power. He predicted that as China built up its military forces, it would become more open to exerting its influence abroad. Chinese citizens and many others around the world now expect precisely that. After evacuating hundreds of its citizens from Libya in 2014, China increased its participation in United Nations peace-keeping missions. And, following a series of attacks in Pakistan, it created a special security force (mostly of private contractors) to protect Chinese interests along the “new silk road” of BRI projects. Another area of Sino-American convergence concerns the multilateral system. In his 2005 “responsible stakeholder” speech, then-US Deputy Secretary of State Robert Zoellick told the West that global-governance institutions must include China or risk being overturned. But to the Chinese, international engagement was never a binary choice. So, rather than becoming a responsible stakeholder in the US-led order, China is now developing what might be described as internationalism with Chinese characteristics. Accordingly, China has taken advantage of membership in Western-dominated institutions while simultaneously defanging them and building a parallel system of its own. But, as the structure of the BRI shows, the world order China envisions is based not on multilateralism, but on bilateral relations between countries. By dealing with other governments one on one, China can negotiate from a position of strength and impose its own terms. Trump’s “America First” doctrine embodies the same vision for the US. Both he and Xi have embraced a message of national rejuvenation. This has led Xi to replace China’s longstanding foreign-policy of moderation and tactical cooperation with one based on the pursuit of national greatness. And both leaders have increasingly taken foreign-policy decisions into their own hands, while undercutting their respective countries’ systems of checks and balances. Although “Cold War 2.0” does not feature the same clash of utopian ideologies as the original, the metaphor is fitting nonetheless. Like its predecessor, this one will feature two superpowers that disagree on how the world should be organized, but agree that there can be only one winner. Mark Leonard is Director of the European Council on Foreign Relations. ON DECEMBER 17TH 2017 the price of bitcoin on CoinMarketCap, a cryptocurrency exchange, neared $20,000. True believers hoped that was just the beginning. One analyst at a Danish investment bank predicted bitcoin could be worth $100,000 by the end of 2018. The year is not yet over. 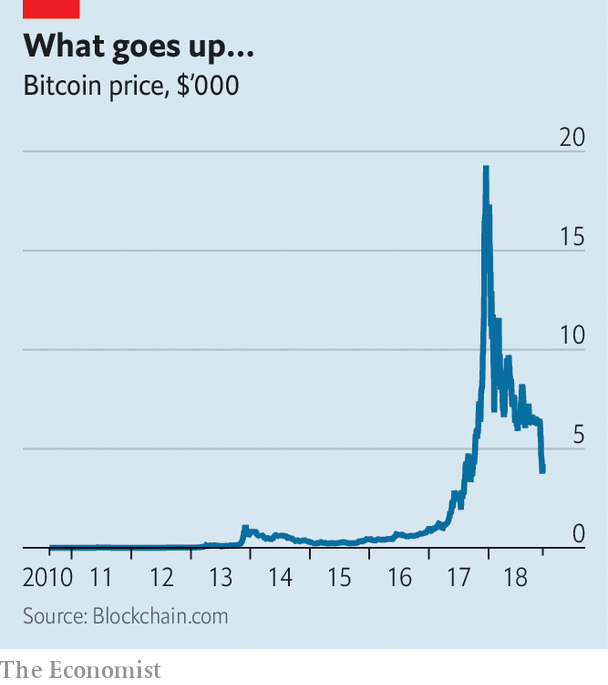 But as The Economist went to press, bitcoin’s price was $4,223, and trending downwards (see chart). Where bitcoin goes, other cryptocurrencies follow. Ether, the second-most popular cryptocurrency, is down from $1,432 in January to $120 today. All this marks the deflating of the third cryptocurrency bubble (the others were in 2011 and 2013). The trigger is unclear. Explaining the movements of deep, liquid markets is tricky at the best of times. Cryptocurrency markets are neither. One popular theory is that the the supply of brave buyers willing to take a punt has now been exhausted. Regulatory interest may be another reason. Cryptocurrencies have long been a haven for fraudsters. Now the law has started to pay attention. 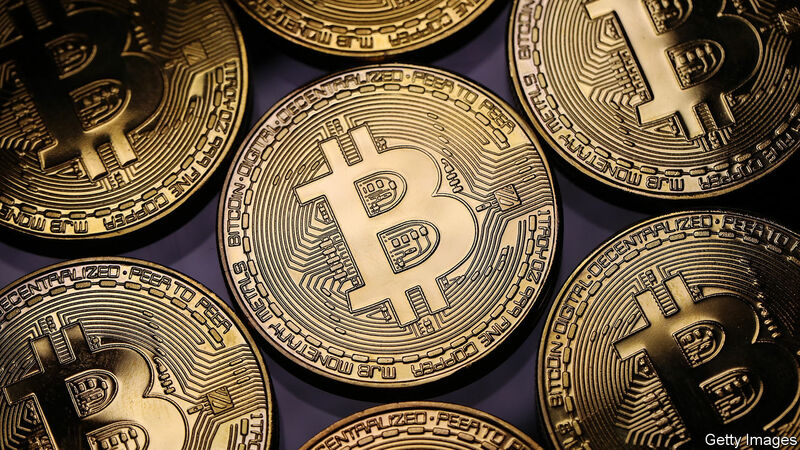 America’s Department of Justice is probing price manipulation in cryptocurrencies, which is widely believed to be rife. The Securities and Exchange Commission (SEC), another American regulator, is investigating several initial coin offerings (ICOs). These are a fundraising wheeze that sell crypto-tokens to investors, who hope that their value will rise in future; they have raised $7.3bn so far this year. Some ICOs are outright scams, in which the firms vanish once the tokens have been sold. But even honest ICOs could be illegal. On November 8th the SEC charged the founder of EtherDelta, a cryptocurrency exchange, with running an unregistered securities exchange. Most fundamentally, bitcoin is still far from its notional goal of becoming a digital alternative to ordinary money. Technical faff, and the volatility that makes it attractive to speculators, means that it is hard to use bitcoin to actually buy things. Morgan Stanley, a bank, found that only three of the 500 biggest online retailers accepted it in 2017, down from five the year before. Punters will be wondering how much lower the price can go. Nobody knows, but hope springs eternal. Smartereum, a cryptocurrency website, is earnestly discussing whether bitcoin could rebound to $50,000—or even $100,000—before the year is out. Caveat emptor.